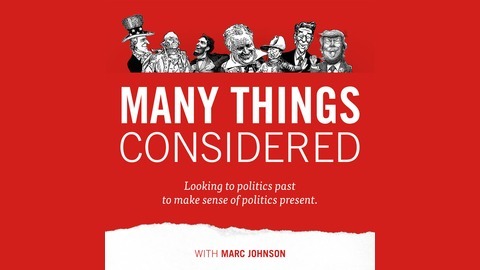 In “Many Things Considered” one-time journalist and full-time political analyst Marc Johnson applies his passion for context to connect current politics with political history. What are the links between the debacle of Barry Goldwater’s 1964 presidential campaign and the Tea Party movement? Did Alexander Hamilton foresee the partisanship that now surrounds judicial appointments? Why haven’t third parties had political success in America? 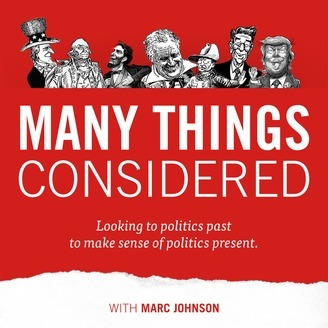 Johnson weaves interviews, archival sound, humor and authoritative narration to connect political history to today’s political stories. The Speaker of the House of Representatives is quitting, not forced out by scandal or defeated for re-election, but quitting after only a little more than two years in office. In historical terms that is very unusual. In this episode Marc Johnson explores what has happened to the job of Speaker of the House, assesses Paul Ryan’s tenure and looks back at the last Speaker who tried to run “the people’s house” in a different way – Tom Foley of Washington. Guests are Charles Franklin, the respected head of the Marquette Law School poll and a close watcher of Wisconsin politics; Professor Josh Ryan of Utah State University, an expert on the job of Speaker; Jeff Biggs, who served as Foley’s press secretary and Seattle journalist Joel Connelly who covered Foley as Speaker and discusses his legacy. We’re all in the House on this one.